Donovan’s DETOUR is a journey that offers unique access to the Tribal Lands of Arizona, including Navajo and Hopi Lands. This 6-day, 6-night guided tour features the annual Western Navajo Fair in Tuba City, AZ. It’s a fantastic combination of contemporary, historical, and cultural experiences with the Navajo and Hopi Tribes. Highlights include Montezuma’s Castle, Horseshoe Bend, Antelope Canyon, Lake Powell, Navajo National Monument, Monument Valley, Canyon de Chelly, Hubbell Trading Post and even Route 66. Donovan Hanley is a Navajo guide and owner of DETOURS Native America. This tour has been personalized design by Donovan so he can share his homeland and upbringing with visitors and locals alike. Small group tour with up to 13 passengers – no crowds! Breakfast, lunch, one hosted dinner and pre-night at Tempe Mission Palms included in tour price! Fall: Pre-night at Tempe Mission Palms on October 8, 2018. Tour departs Tempe, AZ on October 9, 2018 and returns to Tempe, AZ on October 14, 2018. Tours canceled within 35 days of departure will be charged in full. A 10% non-refundable deposit will be taken by credit card at the time of booking. Our vehicles are designed to carry up to 12 passengers in individual leather captain’s seats. Tour group size will range from 8 guest, which is our guest minimum to operate this tour, up to 12 guests in our custom tour vans. The hotels will be 2-3 stars. The accommodation has been chosen to give passengers the best access to the surrounding areas. For those traveling alone there are single occupancy rates available. Individual luggage must be kept to a maximum of one piece of luggage less than 50 pounds. It is recommended to travel with a small day pack for easy access to camera, sun block, and clothing. We advise our clients to pack as lightly as possible. Temperatures in the region offer almost perfect weather but can vary by season. We recommend our guests bring a light jacket in case of occasional showers. Terms and conditions will be provided and must be agreed upon separately for this tour. DETOURS Tours offers small group touring in our custom vehicles featuring leather captain’s chairs for maximum comfort. Because DETOURS travels with a maximum of 13 passengers, this allows us to take a flexible approach and take full advantage of touring opportunities in the American West. Due to the developing tourism industry in the area, changes can and do occur in this type of program. Weather conditions, sometimes severe enough to limit where we can drive or walk, can also alter the program. As visitors, we will respect this, and remain flexible and open to local conditions, safety concerns and unforeseen opportunities. Our guides will do their best to keep things on track and in the event that our schedule changes, they will try to keep disruption to a minimum, consider your wishes, and organize other options as far as it is reasonable and practical to do so. Arrive in beautiful Phoenix, AZ where Donovan will meet you for an informal welcome drink at the airport. He will answer any questions you may have about the upcoming tour and ensure your transport to Tempe Mission Palms so you can settle in before the tour departs in the morning. Feel the cool desert air as we depart Tempe, AZ and travel tour through the Petrified Forest and the Painted Desert to Hubbell Trading Post. This living historic site was built in 1878 and the Navajo people still trade here today. From beautiful baskets to turquoise jewelry, there is much to see and touch when touring Hubbell Trading Post. Next, the guided tour takes us to Window Rock, the capitol of the Navajo Nation. A local official will guide us through the Council Chambers and educate us about how the Navajo Nation is governed. 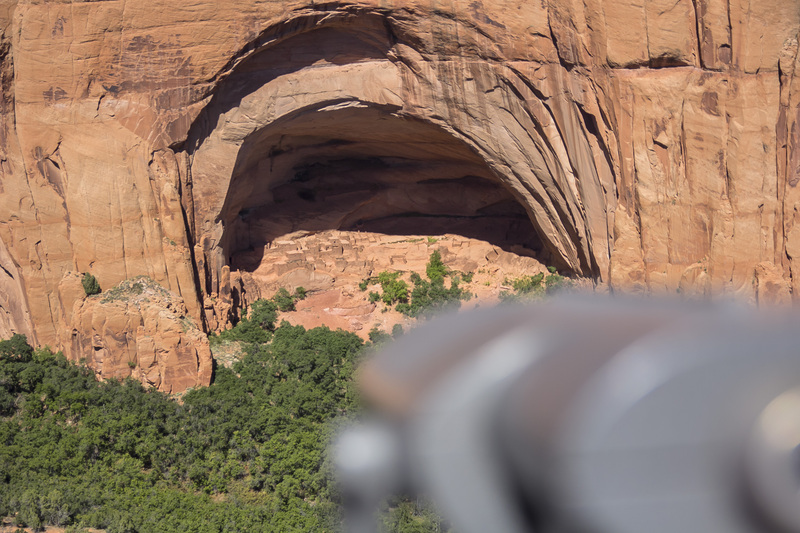 We’ll also enjoy incredible views of the ‘window’ at Window Rock as Donovan explains why this location is especially personal to him. Tonight, we’ll settle in at the Quality Inn after a fun and educational day of native history. This morning we’ll tour to another significant historic post over a century old: Two Grey Hills Trading Post. This location is the primary source of authentic rugs and tapestries, and is known around the world as the finest in Navajo weaving. After a catered Navajo lunch, our group travels the Navajo Overpass along the Chuska Mountains into Canyon de Chelly National Monument in the Heart of the Dinetah. Tour Canyon del Muerto, where Navajo fought off Spanish invdaers and where many hid when the Navajo were forced off their lands in the late 1800’s by the US Army. Heading north, the route takes us into Utah along the San Juan River to visit the Sand island Petroglyph site, a wealth of ancient rock art. It’s a wonderful place for a picnic along the banks of the river. A dramatic drive past the Valley of the Gods leads to Monument Valley for a tour into the heart of this collection of sandstone spires and monuments in the late afternoon light. We’ll take our time to experience this timeless western destination, away from the crowds. Sunset overlooking Monument Valley is a once-in-a-lifetime opportunity! There is an optional sunrise walk before turning west to Navajo National Monument which offers a peaceful walk along the Sandal Trail to the Betatakin Ruins overlook – and maybe a picnic lunch. This was one of the major cities of the Ancient Ones and is a sight to behold. Next, we’ll visit Horseshoe Bend, one of the most iconic and dramatic views of the Colorado River. A short walk to the overlook ends in stunning views of the only 270 degree turn of the river. Tonight, we’ll settle in at the Lake Powell Resort with unparalleled views of the buttes and islands. An optional boat tour of Lower Antelope Canyon through the twisting and turning sandstone formations is available upon request. This morning we’ll join our Navajo guide to hike Lower Antelope Canyon and experience one of the most beautiful slot canyons in the American West. It’s always been a special place for the Navajo, much like a cathedral, and very much a spiritual experience. Explore Navajo Museum in Tuba City for a detailed look into the Navajo culture and history. The afternoon leads us into the Hopi Nation’s First Mesa, the home of historic Walpi Village, continuously inhabited for more than 1100 years. Walpi stands above the valley at 300 feet, surrounded by awesome vistas of the sky and distant horizon. Our Hopi guide will enlighten the group as to the Tribe’s culture and history. Finally on to Route 66 and Winslow, Arizona for our final night at the famous La Posada Hotel. A hosted dinner tonight at the Turquoise Room will celebrate the journey and perhaps help you plan for your next one! After breakfast, we’ll enjoy a beautiful drive along Route 66 to Flagstaff and onto the scenic views of Oak Creek Canyon and Sedona. The famous red rock formations surrounding Sedona are some of the most photographed on Earth. Sedona has been home to several Native American Tribes in the past including the Singua and the Yavapai. The day ends as we travel back to the Phoenix area for your flight home or a continuation of your Arizona vacation at a local resort. Pre-night in Tempe, AZ included. Post-night in Tempe, AZ available upon request.